The masses of "true neutrinos" have long evaded physicists, but the IceCube Neutrino Observatory in Antarctica may help physicists find them. In this illustration, a neutrino interacts with Antarctic ice, shedding a muon in the process. As that muon moves at ultrafast speed, it leaves a telltale trail of blue light, known as Cherenkov radiation. What we call, say, the "tau neutrino" isn't always the tau neutrino. It can change its identity. It can become, midflight, an electron or muon neutrino. This weird phenomenon that basically nobody was expecting is called neutrino oscillation. It means, among other things, that you may create an electron neutrino and send it over to your best friend as a present. But by the time they get it, they may be disappointed to find a tau neutrino instead. For technical reasons, the neutrino oscillation works only if there are three neutrinos with three different masses. But the neutrinos that oscillate are not the electron-, muon- and tau-flavored neutrinos. The job for physicists now is to disentangle all the relationships: What are the masses of those true neutrinos, and how do they mix together to make the three flavors? So, physicists are on a hunt to uncover the masses of the "true" neutrinos by looking at when and how often they switch flavors. Again, the physics jargon is very unhelpful when explaining this, as the names of these three neutrinos are simply m1, m2 and m3. A variety of painstaking experiments have taught scientists some things about the masses of the true neutrinos, at least indirectly. For example, we know about some of the relationships between the square of the masses. But we don't know exactly how much any of the true neutrinos weigh, and we don't know which ones are heavier. It could be that m3 is the heaviest, far outweighing m2 and m1. This is called "normal ordering" because it seems pretty normal — and it's the ordering physicists essentially guessed decades ago. But based on our current state of knowledge, it could also be that m2 is the heaviest neutrino, with m1 not far behind and m3 puny in comparison. This scenario is called "inverted ordering," because it means we guessed the wrong order initially. Of course, there are camps of theorists pining for each of these scenarios to be true. Theories that attempt to unify all (or at least most) of the forces of nature under a single roof typically call for normal neutrino-mass ordering. On the other hand, inverted-mass ordering is necessary for the neutrino to be its own antiparticle twin. And if that was true, it could help explain why there is more matter than antimatter in the universe. Which is it: normal or inverted? That's one of the biggest questions to spring up from the past couple decades of neutrino research, and it's exactly the kind of question that the massive IceCube Neutrino Observatory was designed to answer. Located at the South Pole, the observatory consists of dozens of strings of detectors sunk into the Antarctic Ice Sheet, with a central "DeepCore" of eight strings of more-efficient detectors capable of seeing lower-energy interactions. Neutrinos barely talk to normal matter, so they're perfectly capable of jetting straight through the body of Earth itself. And as they do so, they will morph into the various flavors. Every once in a rare while, they will strike a molecule in the Antarctic Ice Sheet near the IceCube detector, triggering a cascading shower of particles that emit a surprisingly blue light called Cherenkov radiation. It's this light that the IceCube strings detect. 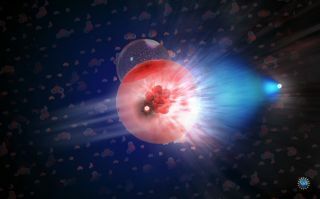 An illustration of a neutrino zooming through the clear Antarctic ice. Occasionally, a neutrino may interact with the ice and trigger a cascading shower of particles that leave trails of blue light in the detector. In a recent paper published on the pre-print journal arXiv, IceCube scientists used three years of DeepCore data to measure how many of each kind of neutrino passed through Earth. Progress is slow, of course, because neutrinos are so hard to catch. But in this work. the scientists report a slight preference in the data for normal ordering (which would mean we guessed right decades ago). However, they've found nothing too conclusive yet. Is this all we'll get? Certainly not. IceCube is preparing for a major upgrade soon, and new experiments like the Precision IceCube Next Generation Upgrade (PINGU) and Deep Underground Neutrino Experiment (DUNE) are gearing up to tackle this central question too. Who knew that such a simple question about the ordering of neutrino masses would reveal so much of the way the universe works? It's too bad it's also not an easy question. Paul M. Sutter is an astrophysicist at The Ohio State University, host of "Ask a Spaceman" and "Space Radio," and author of "Your Place in the Universe."